Edging the Gulf of Mexico, Pier House Resort features 119 waterfront guestrooms and 23 expansive suites for unforgettable Key West vacation experiences. Whether soaking in the sun on a romantic getaway, adventuring with family or seeking a tranquil outpost with friends, our oceanfront Key West accommodations surround you in luxury and serenity. Designed with warm coastal decor, all of our rooms and suites feature large tiled bathrooms, gorgeous rain-style showers, custom furniture, local art and a connection to the waterfront. Relax on your private balcony to soak up the warm Florida sun and savor breathtaking views of the sea or beautiful gardens. Our Traditional Rooms feature either one King or two Queen beds with pillow top mattresses and custom designed pillows. These rooms feature a beautiful glass and tile walk in rain shower with luxury H2O amenities. With plenty of space to stretch out, our Lanai Rooms feature either one King or two Queen beds with pillow top mattresses and custom designed pillows. These rooms feature a beautiful glass and tile walk in rain shower with luxury H2O amenities. All of these rooms feature a patio or balcony with a beautiful view of our tropical surroundings. Tucked away steps from a secluded whirlpool and one of the finest spas in the Florida Keys, these spacious junior suites are ideal for a romantic escape. These rooms feature a spacious sitting area and over-sized bathrooms with a large glass and tile walk in rain shower. All of our Spa Junior Suites feature King-sized beds with pillow top mattresses and custom designed pillows. Perched above the ocean waves, these peaceful rooms feature unobstructed views of the Gulf of Mexico and the famous Key West sunsets. These rooms feature a private balcony to enjoy our breathtaking views. Experience one of the best places to stay in Key West with either one King or two Queen beds featuring pillow top mattresses and custom designed pillows. Perfect for a Caribbean family adventure, romantic getaway, or Florida retreat, our tasteful One-Bedroom Suites boast extra space featuring a separate living area to relax after an evening on Duval Street. Patios and balconies are the perfect escape for enjoying the Key West sunshine and our tropical island breezes. These stunning suites feature either one King or two Queen beds with pillow top mattresses and custom designed pillows. 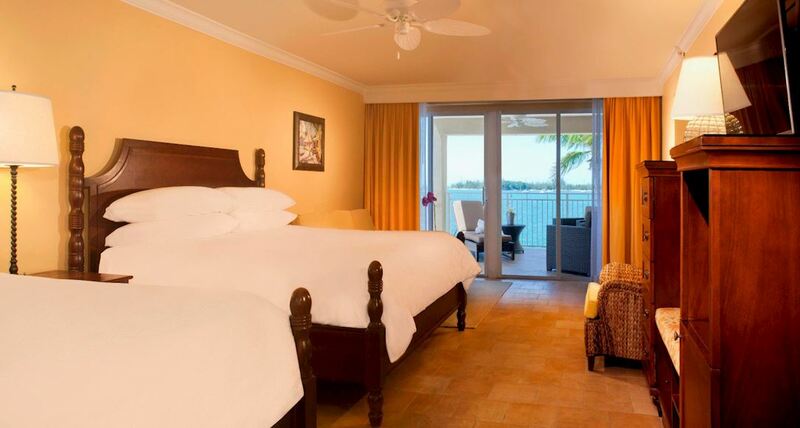 With a private balcony, unobstructed ocean views, and a sitting area, these suites are Key West lodging at its finest. Some of these rooms feature a spiral staircase. Enjoy either one or two King beds with pillow top mattresses and custom designed pillows. Soak in the oasis of paradise with our spacious Deluxe Ocean View Suites. These suites feature a separate living area and master bedroom with island chic decor and a balcony overlooking the beautiful turquoise waters of the Gulf Of Mexico. With a spacious bathroom featuring a walk in glass and tile rain shower, as well King-sized beds with pillow top mattress, these suites are perfect for any romantic getaway. Our Luxury Ocean View Suites offer more space to take in the breathtaking views of the Gulf of Mexico. These luxurious suites feature one King-sized bed with a pillow top mattress, an expanded balcony with a wet bar, and a palatial living area. With a large free standing tub and oversized shower, these suites offer an extra dose of luxury. Watch boats sail across the sparkling blue Gulf of Mexico from your elegant Dockside Suite atop the water. Step out onto your sprawling Infinity Balcony for unobstructed views of our legendary Key West sunsets. Immersed in the serenity of the waterfront, these luxury suites feature a separate living room, and one King-size bed. Steps from the beach, our luxurious two-bedroom suites are the ultimate Key West retreat. Perfect for romance and entertaining, our 1,200-sq-ft. Two-Bedroom Ocean View Suites surround you in Key West hospitality with two King-sized pillow top mattresses, two bathrooms, a shared living area, wet bar, entertainment center, and a waterfront balcony. These stunning two-story suites are great for families and friends on vacation. Indulge in the ultimate Key West getaway, with stunning vistas from the highest point of our resort. At 1,450 square feet, the luxurious Presidential Suite encompasses an entire floor, complete with a whirlpool hot tub, a multi-seat bar, two bathrooms, two bedrooms, two King-size four-poster beds and large balconies overlooking the waterfront and cityscape. Call directly to book at 800-327-8340.